Nelson Ward does not have any MLB stats for the season. Draft: 2014, Seattle Mariners, 12th rd. November 6, 2017 2B Nelson Ward elected free agency. April 18, 2017 2B Nelson Ward assigned to Arkansas Travelers. April 17, 2017 Seattle Mariners signed free agent 2B Nelson Ward to a minor league contract. March 29, 2017 San Antonio Missions released 2B Nelson Ward. April 4, 2016 2B Nelson Ward assigned to San Antonio Missions from Lake Elsinore Storm. March 9, 2016 IF Nelson Ward assigned to San Diego Padres. November 13, 2015 SS Nelson Ward assigned to Lake Elsinore Storm. November 12, 2015 San Diego Padres traded RHP Joaquin Benoit to Seattle Mariners for RHP Enyel De Los Santos and SS Nelson Ward. August 26, 2015 Bakersfield Blaze placed SS Nelson Ward on the 7-day disabled list retroactive to August 22, 2015. August 22, 2015 Bakersfield Blaze activated SS Nelson Ward. June 2, 2015 SS Nelson Ward assigned to Bakersfield Blaze from Clinton LumberKings. March 27, 2015 Nelson Ward assigned to Seattle Mariners. March 20, 2015 SS Nelson Ward assigned to Seattle Mariners. August 12, 2014 SS Nelson Ward assigned to Clinton LumberKings from Everett AquaSox. 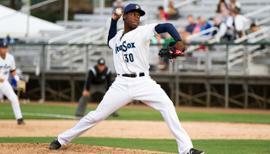 July 1, 2014 SS Nelson Ward assigned to Everett AquaSox from Pulaski Mariners. June 16, 2014 SS Nelson Ward assigned to Pulaski Mariners. June 12, 2014 Seattle Mariners signed SS Nelson Ward.